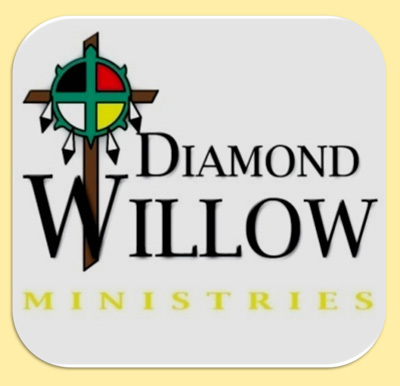 Diamond Willow Ministries (DWM) is a 501c3 non-profit Christian relief organization (all contributions to this ministry are tax deductible) comprised of members brought together by a common vision. God has worked in wonderful ways to bring together our varied group of individuals, who are compelled to love and serve here with our unique talents. We are comprised of Dakota, Lakota, and non-Indians, most of whom work and live here on the Crow Creek Reservation. We however, are only one part of the DWM team. The great things happening here are also the result of those from around the world who see the need, share the vision, and contribute through giving financially and through prayer. DWM is not a part of any denominational system, but it is associated with and supported by independent congregations which are generally called Christian Churches or Churches of Christ. These churches call all Christians to unite behind the practices and teachings of the church described in the New Testament as a means of more effectively evangelizing the world. Just wanted to say thank you really. As a young man growing up and loosing my mum to the troubles in northern ireland i never thought that God could quite forgive and love someone as rough as me. I started listening and learning from people like Rich and Brennan and by the grace of God we got signed to a UK Christian record label last year. So really this is a thank you, for continuing the work that helped me find myself in the true Christ and show that even someone like me can be transformed by the grace of an ever present God. I was born and raised in the UK in a small farming town and became a Christian at seventeen, over forty years ago! When I visited the USA and married an American girl, I discovered Rich’s sweet music. Until I watched the Ragamuffin movie this weekend (Oct. 2014), I never realized or had a clue that Rich was so troubled and hurting as he sought to love his Lord and Savior and walk in God’s ways, yet we always knew he was anointed. As a former worship leader, I often sang Awesome God and Step by Step and to be honest Rich is probably one of my favorite all-time Christian singers alongside Keith Green. Hey, they are both singing for the Lord in heaven now! I’ve known the music. Through the movie, now I know more about the song writer. I, too, am from Indiana. For the last 6 years, I’ve been teaching here in Pinon, AZ – the geographical center of the Navajo Nation. We have great kids. They yearn for an identity – apart from what the government continues to push them towards. Our kids love to sing gospel music in our small, rural church. Our needs are small – our God great! God bless! I remember many car trips through the 90′s playing Rich’s music over and over – my children were weaned on his beautiful lyrics. I was weaned on his lyrics, too. His words still continue to draw me into God’s love. I just saw Ragamuffin last weekend – some parts were hard to watch and others brought back many good feelings of things I always thought I knew about his life. I was glad the movie portrayed Rich as a “ragamuffin” and not as a Christian “superstar,” even though to me, that’s what he was. I’m glad for this ministry and that his legacy continues. I just saw Raggamufffin last week and it has brought me to reevaluate my life. I’ve been a Christian since I gave my life to Jesus age 10, struggled with many problems, yet can still all God my anchor in the storm, my firm foundation and loving father. I need to pay more attention to him. I grew up in Gallup NM and I pray that God continue his wild spirit working in that area, it is sacred to me and the surrounding reservation lands, though they are incredibly beautiful, many people there are in need of a loving savior who knows them even before they were born, who loves them for who they are, who has such beauty in his creation and he inspires beautiful culture and is not a destroyer of culture. I believe Rich probably felt the same way and I’m thankful that he felt such a powerful love and need to serve broken hearts on the Reservation! God thankyou for Rich! I saw the movie Raggamuffin on Netflix just recently. It was very moving since many of my family members struggle as Rich did with finding love and acceptance from their earthly father. I felt like I was watching my son’s life story unfold before my eyes. A deeper desire to understand better what my son is dealing with instead of shaking my head at the things he does. Thanks for making this movie the way you did. I think it has changed me more into a Raggamuffin for God than ever before. Just Divorced and hung out with the garbage, in 1992 a friend gave me a tape with Rich’s “Sometimes By Step” and other “prayer” songs. That tape I played over and over for hours in my loneliness and loss. In the years since Father rescued me time and again from my own falls, and my second wife went away from this earth not long ago. Assessing things, I returned to Rich’s beautiful Brothertship in Y’suah, and here I am. more humbled, and more aware of Father’s saving Grace. I so wish Rich and others with Heavenly passion would pay heed to health, and forget fans and appointments. This earthly life is so fragile we need to listen to the body Father provides us and when it says “STOP!,” pay heed and rest. Father Himself gives us this liberty to Rest on purpose. His Creation Word was stilled the evening of the Seventh Day, the Shabbat, recorded by Moshe’, and translated in English wrongly as the evening of the 6th day. Remember, Father counts Day as beginning in the evening! So, Rich and all others aspiring to feed fans, STOP! when your body tells you to! Had Rich listened, his ministry would be alive today. Like the Irish fishermen, he goofed, and his disfigured remains washed ashore, with the sweater Y’suah made for him. Let’s be Live Warriors for Y’suah. Out lack of listening causes Him great sadness. Do we desire to face Him with our fatal mistake as the cause? The Lord knew from the beginning of time when and how each of us will die, and He does indeed teach us to “number our days.” But let us be careful not to insert or own reasoning to try and understand God’s ways. Thanks’ for everything you folks are doing, and are going to do! Please give me a call at: 262-886-2824.